Edmonton’s social darling and media maven, Brittney Le Blanc, is a huge advocate for all things Edmonton, including the city’s public art scene. Over the last several years, Britl (as she is known on Twitter and Instagram) has developed an extensive network in the city (you may remember her as the girl with a quest to meet 5,000 people in one year), and has dedicated countless hours to Edmonton-positive movements, including the Yeggies and Make Something Edmonton. She has connections around the city and across the globe, and often offers to take her out-of-town guests on tours of the city’s most interesting public art landmarks (she once planned to take a celebrity cat around, but ended up only taking its owners). Britl’s Public Art Ride – 3 km, suitable for a picnic or afternoon of exploration (map). Alberta Avenue community. Love it or hate it, the bat has been in the area since the late 1990s. Standing at 14.9 metres tall, it was once the largest baseball bat in Canada. In 2014, its size was overshadowed by one built at the Saskatchewan Baseball Hall of Fame (though reports are unclear as to whether this larger bat spins, because at least Edmonton’s does). The sculpture remains in its place for the time being — a real home run for Brittney, who insists on bringing out-of-town guests and celebrities to spin it whenever she has the opportunity. 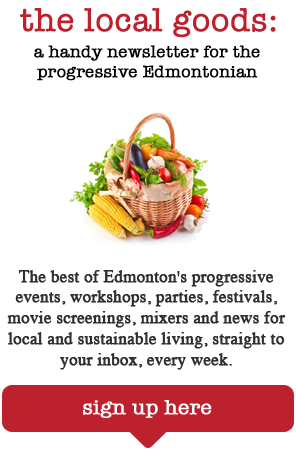 From there, it’s a short jaunt down Alberta Avenue, to the Carrot Community Arts Coffeehouse. Supported by Arts on the Ave, the coffeehouse is a great space to stop for a coffee and enjoy work by local artists and musicians. Since 2005, Arts on the Ave has worked to develop a community arts district along 118 Avenue from 75 Street to 106 Street. In the process of doing so, the organization has supported the creation of a number of murals and public art pieces along the street and in the connecting alleyways. Britl recommends taking a stroll down the avenue to take in the variety of murals before stopping in at Handy Bakery for some delicious Portuguese custard tarts (given Britl’s involvement in the city’s culinary scene, it’s virtually impossible to go more than a few minutes without salivating over the delicacies offered along the way). With pastries in hand, it’s a difficult bike ride, but an easy enough walk to nearby Borden Park. Like much of the rest of this area, Borden Park has been undergoing a revitalization over the past few years. Work has included the installation of new paths and fountains, as well as an exceptional collection of public art. Most of the sculptures in the park have accompanying plaques, which were installed by the Edmonton Arts Council (EAC). These plaques can be seen on a number of public art exhibits around the city, and identify the pieces, the artists and any significant details. Borden Park features works by artists such as Peter Hide, Ken Macklin, Royden Mills and Clay Ellis as a part of the EAC’s Temporary Sculpture Loan Program. Through this program, the council hopes to expose Edmontonians to new public art in well-known areas. The council will change the art after a set period of time, with this round set to say in place until summer 2016. Currently, there are 11 unique pieces positioned throughout the park, but the art isn’t limited to sculptures. Carousel, an abstract mural painted just inside the mirrored walls of Borden Park’s public washroom, is a nod to the park’s history as a former fairground. The building itself is architecturally appealing as well, almost reminiscent of a snare drum (and, strange as it may sound, it makes for a great selfie spot in the reflective walls). day, the shadows outlined through the sculpture dance across the ground, creating interesting star and spaceship-shaped patterns as they go. So stay for some time and enjoy the sculptures of the Borden ArtPark — enjoy a picnic, and let the kids get up close to examine and imagine the stories behind the park’s collection. Hopefully you’ve enjoyed the artwork on today’s journey. Stay tuned for the next public art ride to be published in the next few weeks! For more information on Edmonton’s collection of public art, visit the Edmonton Arts Council’s Public Art website, where you’ll find information on hidden gems all around the city. And, if you’re looking for a longer bike ride, an 11-kilometre adventure in the river valley can be found here.